Do you struggle to create a beautifully set table? 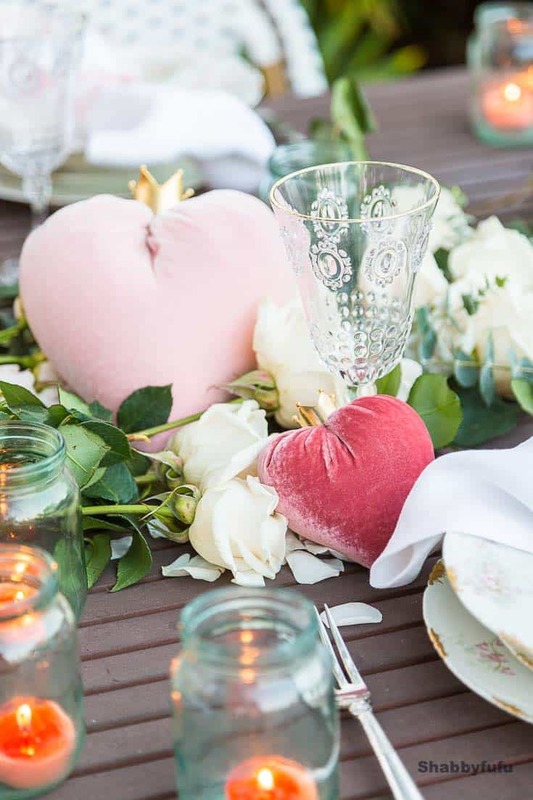 Some simple table decor tips for Valentines Day or any day that you have guests coming over for dinner. 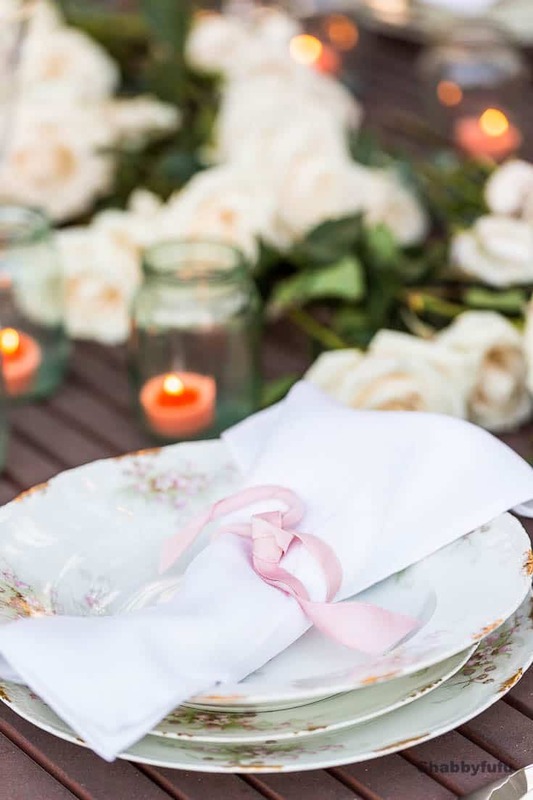 You don’t need to be Martha Stewart to set a beautiful table nor should you feel intimidated. I prefer to make my own rules when it comes to decorating the table. If you are going all out formal that might be different, but for friends and family I say…make it yours! The only “rule” that I tend to follow is one that makes perfect sense. Fork to the left, knife to the right (blade facing in) and spoon beside if one is necessary. 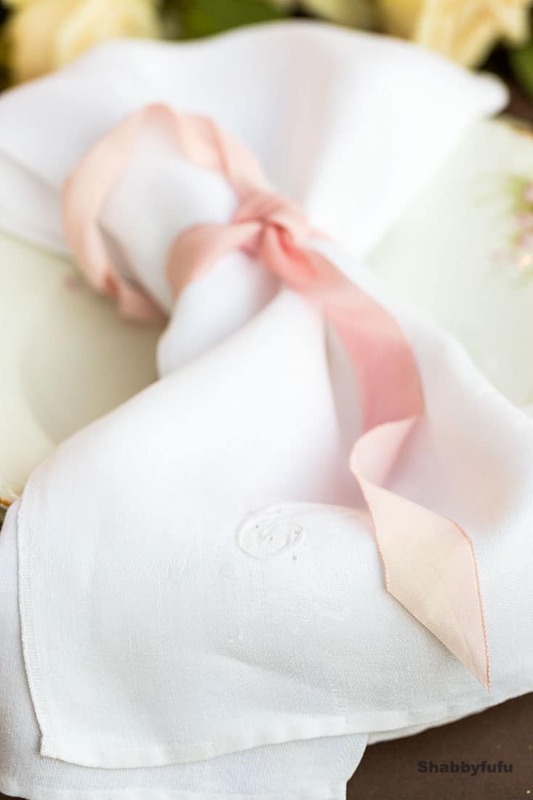 I love a cloth napkin and will plop it on the plate casually, in-between the plate stack or even on the right. Sometimes stuffy rules are outdated and made to be broken, so here are some table decor tips to use loosely. Decide on this first and build your table decor setting from there. I had a couple dozen grocery store roses left over from the week before that were wilting. Rather than toss, I decided to use the roses plopped loosely on my table down the center. This set the scene for a rustic and romantic setting and you could definitely do this indoors as well. 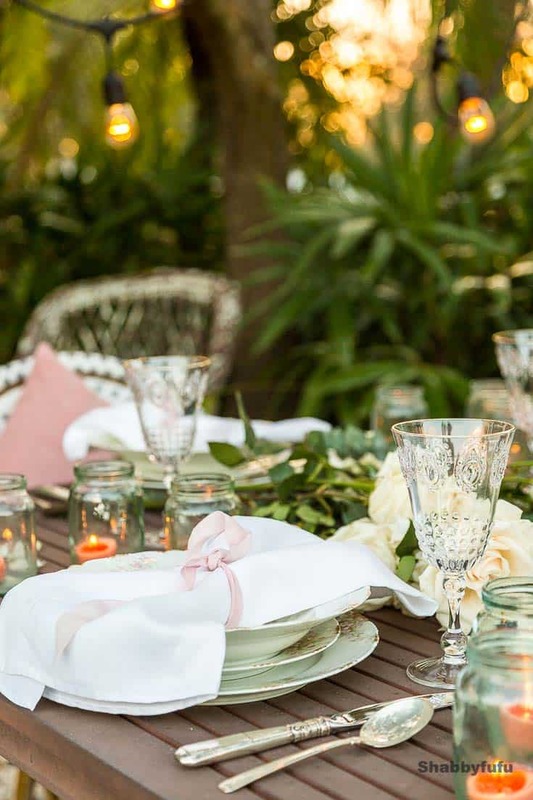 With table decor tips, think of your tablescape as a three dimensional object of art! You have your centerpiece, and next comes the individual place settings. Start with your plates and layer them, as I talked about a couple of years ago in THIS POST for Valentines Day. I love (and collect) vintage and antique dishes. These days you can find them easily at thrift shops with so many people decluttering and downsizing. 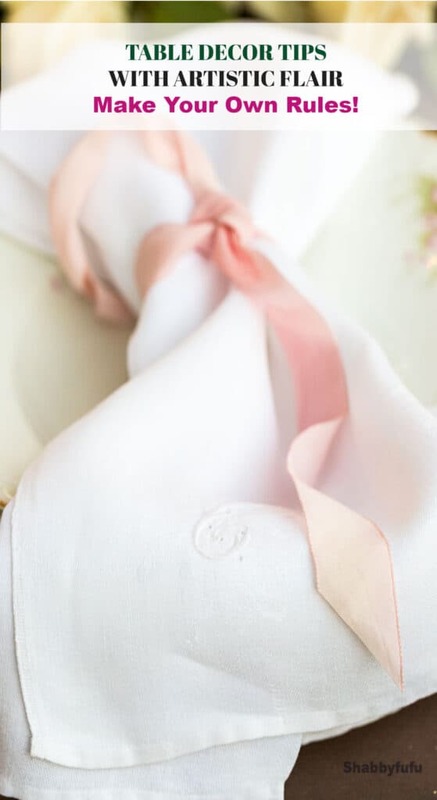 We aren’t formal in our home, so I grabbed an antique linen napkin and tied a piece of hand painted silk ribbon to tie as a napkin ring. If you’re interested in learning more about how to paint ribbon, see my TUTORIAL. Everything can be affordable and the trick is to collect over time. Look for flatware and stemware at yard sales and thrifts, as there is where much of my own came from. These antique looking wine glasses were a recent purchase and came from HomeGoods. They are acrylic, which is great for parties and outdoor use! Mix and match the fancy with the plain, the old with the new. It’s unexpected and much more interesting than matchy matchy! Making it yours with just one whimsical accent is something that makes a table memorable and fun. 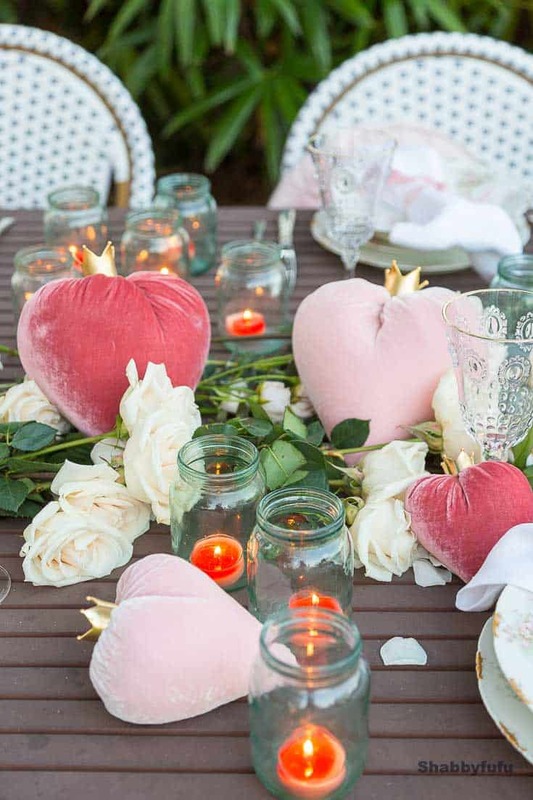 These pink velvet hearts add just that sweet touch! For Valentines Day, add some heart shaped cookies to the table or hearts cut from paper. The trick to whimsy is just to not go too overboard and keep it fairly simple. 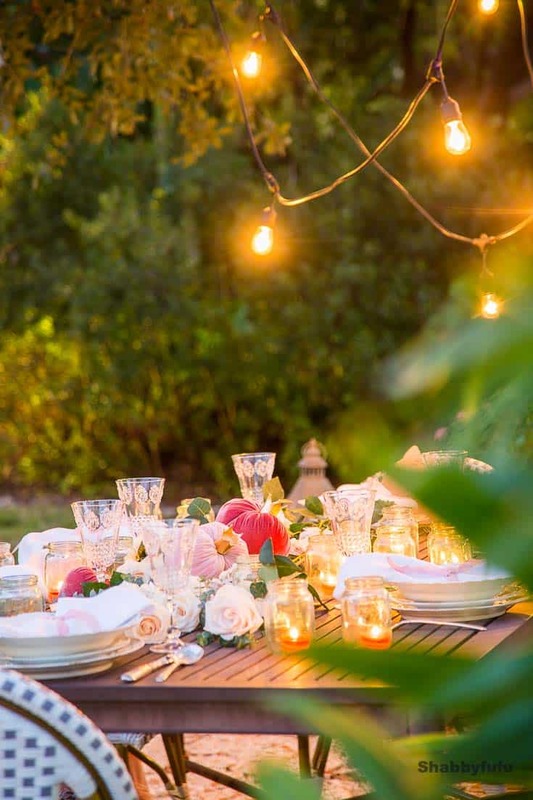 Candlelight is my favorite way to bring ambiance with table decor tips that I love to share. Indoors or out, candles in glass glow in the evening light and are protected from the breeze. These small jars are antique French yogurt jars, but look for small jars in the craft store or yogurt in jars at the grocery. As with any “art” that you create, take some big steps back and look at the composition. Is everything set so that real people can sit and enjoy? Do you have enough of everything so that you won’t have to constantly be interrupted to get up for more? Does the table look and feel balanced? And finally…do you have enough light? What are some of your table decor tips? Let us know in the comments! ahhh yes i love this idea- im always looking for some inspiration for table decor tips especially for the upcoming holiday -i love all all the soft tones and colors you choose because you can add so much more to it or make it as soft and neutral as possible! i think stepping back and looking at it is key to help move things around and make it exactly like you want! This is such a gorgeous table! I’ll be honest, we’ll probably just order pizza on Valentine’s Day and eat it off paper plates. My husband and I aren’t really fancy folks. YOu did such a wonderful job with this. I love the Shabby look. I’m enjoying seeing your post this morning and dreaming of the warm, sunny weather. Here in lower Michigan we are currently at -15 with wind chills far below that. It’s all part of the Michigan experience and we will get through it but I do enjoy a little dreaming of weather to come.Thanks for your posts, I always enjoy them. It is very obvious that you know what you’re doing. The table setting looks absolutely gorgeous. You should come do my table. I do not have a decorative bone in my body LOL. Thanks my friend! I’ve had a few unsubscribers today…probably mad people who don’t like me posting outdoor settings right now, LOL! 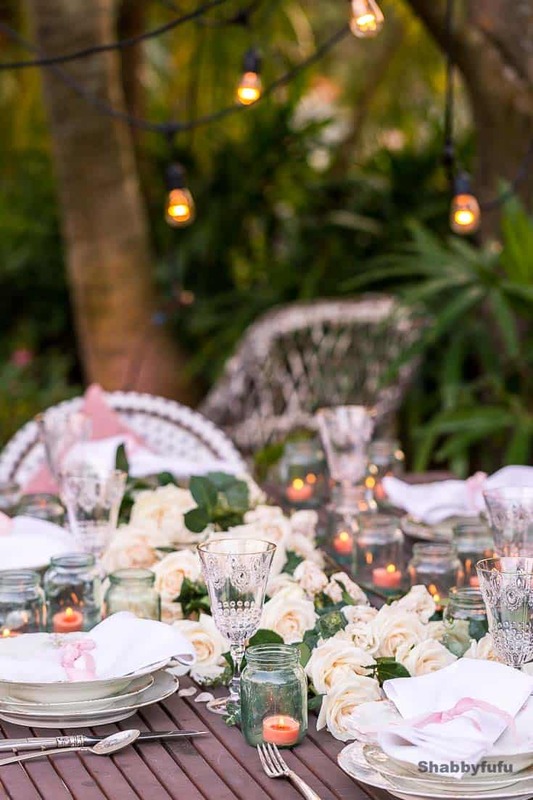 I always make our Valentine’s Day dinner tablescape special, however, these ideas and tips will kick it up several notches. When you stop and think about it, it all makes sense. However, you do make it look easy! Thank you, Janet. I just love the velvet hearts with the gold crowns! Those are the frosting on the cake for sure. Are those available for purchase somewhere online Janet? Hi Jo, Thank you for that and I hope that these simple tips do help! You can find the velvet hearts with crowns at the website LoveFeastShop. First, I love that it’s outside. I’m not sure my weather will allow for alfresco dining on February 14, but it’s gorgeous, none the less. I particularly love the tea lights. This great outdoor table is warming me up but I will not be out in 4 degree temperature where I am. These are great ideas and there is a lot of great buys at yard sales. What a beautiful table! I love setting a nice table whenever I can. I love the napkins you used. Oh wow this is such a gorgeous table layout. Perfect for a romantic dinner for two come Valentines. 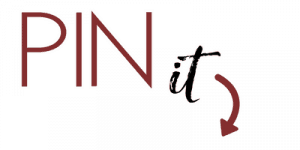 I love your blog – your one of my favorites. Your photos are breath taking and what you write about is always inspiring to me. But I have something funny to say, you live in Miami where the weather is always gorgeous – sometimes a little too hot, but that’s ok because it’s beautiful there (actually thought about moving there years back). The funny thing is that in mostly all of your photographs outdoors, it’s beautiful for where you live, but what about us that live in the North East, like way up in Boston? These are really helpful tips. I love this tablescape. I typically search around my home for items that I could possibly use and repurpose. Love your table and thank you for some great ideas. I live in Texas and right now our weather is cool enough to enjoy. I agree in a short while the heat can make it uncomfortable then my mind wanders to cooler places.
. Enjoy your post so much!!! Thank you so much Debbie…have a wonderful week! 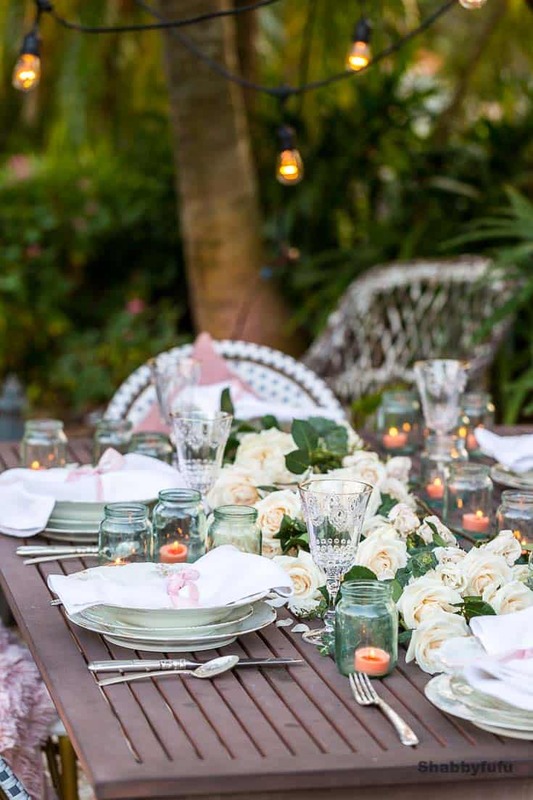 Wonderful table setting ideas! Yours is stunning! It’s fun and elegant without looking childish. I love these tips. I don’t think any of my party tables have ever looked this good. Your table setting is beautiful! I’m a huge fan of mixing vintage items with some modern elements. 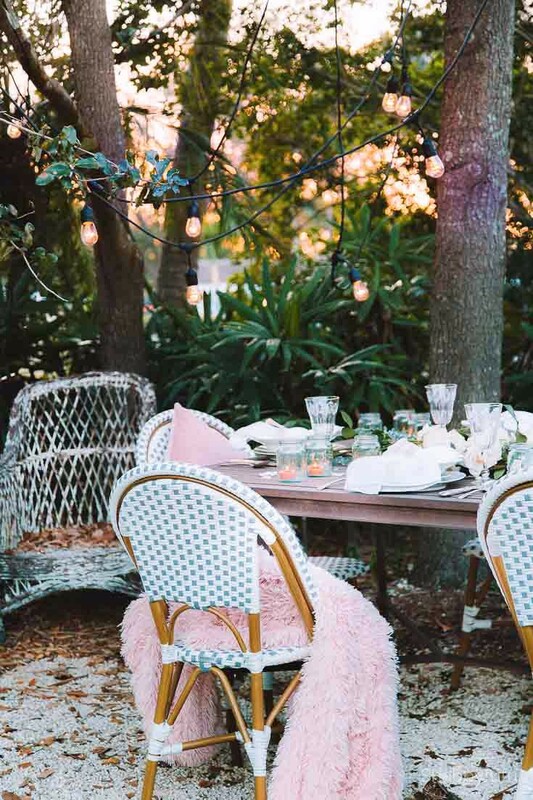 With a table this pretty, it wouldn’t matter what you served, it would be super romantic and fun! I love this table setting. I love the notion of “layering” the design. The centerpiece is perfect. I get so annoyed when I can’t see the person on the other side of the centerpiece. Valentine’s Day is my FAVE and I love celebrating it!! I absolutely love your tablescape!! Table setting is gorgeous as usual Janet! I live in coastal Mississippi so we’ll probably have nice enough weather to eat outdoors if we were so enclined. We don’t really make a fuss about Valentine’s Day though, lol. I’m really loving your Parisian cafe chairs for outdoors. They’re so cute! I’d like to see some more French country vignettes. Thanks! Have a great day tomorrow! I wish we have a weather that could could accommodate an outside set up for valentine’s day. What a fun setup for Valentine’s Day. I love the cushion pillow idea.